Tailor Made Reports (TMRR) offers a 10-year forecast for the global NB-IoT chipset market between 2018 and 2028. In terms of value, the NB-IoT chipset market is expected to register a high CAGR during the forecast period. This study demonstrates the NB-IoT chipset market dynamics and trends globally across eight regions: North America, Latin America, Western Europe, Eastern Europe, Asia Pacific excluding Japan, Japan, and the Middle East Africa, which influence the current nature and future status of the NB-IoT chipset market over the forecast period. This research report provides a detailed analysis of the NB-IoT chipset market and offers insights about the various factors driving the popularity of NB-IoT chipsets and their features. The report includes an extensive analysis of the key industry NB-IoT chipset market drivers, NB-IoT chipset market restraints, NB-IoT chipset market trends, and market structure. The NB-IoT chipset market study provides a comprehensive assessment of the stakeholder strategies and imperatives for succeeding in the business. The report segregates the NB-IoT chipset market based on the deployment type, device, and industry verticals across different regions globally. The NB-IoT chipset market is expected to witness significantly high revenue growth during the forecast period owing to the increasing initiatives undertaken by the government for the implementation of NB-IoT networks across major countries, and an increase in the number of smart city projects. Moreover, the demand for connected devices from the end users is also boosting the implementation of NB-IoT chipsets across various countries. The global NB-IoT chipset report starts with an overview of the NB-IoT chipset market in terms of value. In addition, this section includes an analysis of the key trends, drivers, and restraints from the supply, demand, and economy side, which are influencing the NB-IoT chipset market. On the basis of the deployment type, the NB-IoT chipset market is segmented into standalone, in-band, and guard band. On the basis of device, the NB-IoT chipset market is segmented into smart appliances, smart meters, trackers, alarms & detectors, wearable devices, and others. 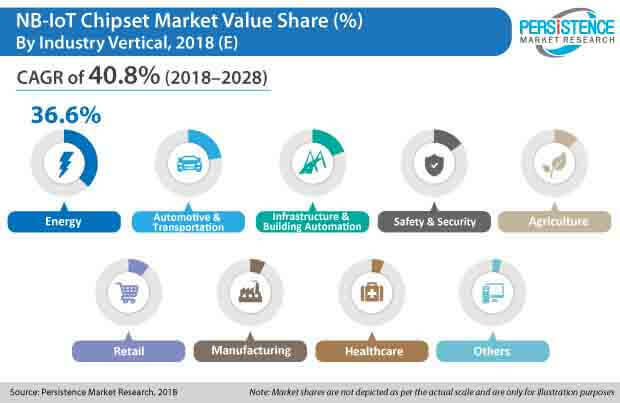 On the basis of industry vertical, the NB-IoT chipset market is segmented into agriculture, automotive & transportation, energy, healthcare, manufacturing, retail, safety & security, infrastructure & building automation, and others. A detailed analysis has been provided for every segment in terms of the market size analysis of the NB-IoT chipset market across different regions. This section provides a detailed analysis that covers the key trends in the NB-IoT chipset market of different regions. The next section in the global NB-IoT chipset market consists of a detailed analysis of the NB-IoT chipset market across various countries in the region. It provides a market outlook for 2018–2028, and sets the forecast within the context of the NB-IoT chipset market to include the latest technological developments as well as offerings in the NB-IoT chipset market. This study discusses the key trends within countries that contribute to the growth of the NB-IoT chipset market as well as analyses the degrees at which drivers are influencing the NB-IoT chipset market in each region. The key regions and countries assessed in this report include North America (the U.S. & Canada), Latin America (Brazil, Mexico, & the rest of Latin America), Western Europe (Germany , France, the UK, Italy, Spain, Benelux, & the rest of Western Europe), Eastern Europe (Russia, Czech Republic, & Rest of Eastern Europe), APEJ (China, India, ASEAN, Oceania, & the rest of APEJ), Japan, and MEA (GCC Countries, Turkey, South Africa, North Africa, and the rest of MEA). The report on the global NB-IoT chipset market evaluates the present scenario and the growth prospects of the NB-IoT chipset market in various regions globally for the period 2018 –2028. We have considered 2017 as the base year, and provided data for the remaining 12 months. To offer an accurate forecast, we have started by sizing the current market, which forms the basis of how the NB-IoT chipset market will grow in the future. Given the characteristics of the NB-IoT chipset market, we have triangulated the outcome of different types of analysis based on the technology trends. As previously highlighted, the global NB-IoT chipset market is split into a number of segments. All these segments in terms of deployment type, device, industry vertical, and different regions are analyzed in terms of basis points to understand an individual segment’s relative contribution to the growth of the NB-IoT chipset market. This detailed information is important for the identification of the various key trends of the global NB-IoT chipset market. In addition, another key feature of this report is the analysis of all the key segments in terms of absolute dollar opportunity. This is traditionally overlooked while forecasting the market. However, absolute dollar opportunity is critical for assessing the level of opportunity that a provider can look to achieve, as well as to identify the potential resources from a sales and delivery perspective in the global NB-IoT chipset market. In the final section of the report, we have included a competitive landscape to provide clients a dashboard view based on the categories of providers in the value chain, their presence in the NB-IoT chipset portfolio, and key differentiators. This section is primarily designed to provide clients an objective and detailed comparative assessment of the key providers specific to a market segment in the NB-IoT chipset supply chain and the potential players for the same. Report audiences can gain segment-specific vendor insights to identify and evaluate key competitors based on an in-depth assessment of their capabilities and success in the marketplace. The detailed profiles of providers are also included in the scope of this report to evaluate their long-term and short-term strategies, key offerings, and recent developments in the NB-IoT chipset market. Some of the key competitors covered in the global NB-IoT chipset market report include Huawei Technologies Co., Ltd., Qualcomm Technologies Co., Ltd., Intel Corporation, ARM Holdings AG, u-Blox Holding AG, SEQUANS, Altair Semiconductor, Nordic Semiconductor, Quectel Wireless Solutions, Sierra Wireless, Huawei, Qualcomm, and u-Blox. These players are witnessed to be the Tier-1 players of the global NB-IoT chipset market. NB-IoT chipsets are hardware components that are mandatory for enabling an NB-IoT network and a Low-Power Wide-Area Network (LPWAN). Increasing awareness about the advantages associated with IoT, with the increasing penetration of the same, has propelled the demand for NB-IoT networks as well as NB-IoT chipsets across the globe, especially across emerging countries such as India, China, and Mexico. As NB-IoT is a major segment of cellular IoT and it enables an IoT M2M environment even in the absence of the Internet, it is expected to witness a high growth rate. Owing to the same, initiatives have also been undertaken by the governments of various countries in collaboration with telecom service providers such as Vodafone. This has boosted the demand for hardware components such as NB-IoT chipsets/modules. In this report, PMR has segmented the global NB-IoT chipset market on the basis of deployment type, device, and industry vertical. By deployment type, the NB-IoT chipset market is segmented into in-band, guard band, and standalone. Among the three segments, the standalone segment was witnessed to hold the minimum market share in 2018 in the global NB-IoT chipset market. Due to the complexities associated with the standalone deployment type segment, the same trend is expected to be witnessed in the global NB-IoT chipset market during the forecast period. In addition, the increasing deployment of LTE across the globe, as it integrates easily with the in-band deployment model, is expected to be among the factors boosting the deployment segment during the forecast period. Thus, while the standalone segment of the NB-IoT chipset market is expected to witness a decline in its NB-IoT chipset market share during the forecast period, the in-band segment is expected to witness a gain in its share in the NB-IoT chipset market during the forecast period. However, due to the easy integration of LTE-M with LTE (as compared to the integration of NB-IoT with LTE), a higher preference for the same has been witnessed in some of the countries, especially across the U.S., in the cellular IoT market. Thus, the higher preference for LTE-M is hampering the growth of the global NB-IoT chipsets market. On the basis of device, the NB-IoT chipset market has been segmented into smart appliances, smart meters, trackers, alarms & detectors, wearable devices, and others. In terms of value, the smart meters segment is expected to exhibit a significant market share throughout the forecast period in the global NB-IoT chipset market. The same segment in the global NB-IoT chipset market is expected to be highly lucrative in terms of incremental opportunity owing to the early adoption of NB-IoT chipsets across the energy segment, and the high demand & growth rate associated with the segment in the NB-IoT chipsets market. However, the trackers segment is expected to exhibit the highest growth rate during the forecast period due to the high demand for M2M connection and investments made by the government to initiate smart city projects across developed and emerging countries in the global NB-IoT chipset market. On the basis of industry vertical, the NB-IoT chipset market is segmented into agriculture, automation & transportation, energy, healthcare, manufacturing, retail, safety & security, infrastructure & building automation, and others. The advent of technology and the increasing penetration of smart devices has boosted the demand for smart homes and smart cities among end users. As the adoption of NB-IoT chipsets enables a connected devices M2M environment, the infrastructure and building automation segment is expected to witness high growth in terms of value in the global NB-IoT chipset market. Moreover, the energy segment is expected to witness the high adoption of NB-IoT chipsets and the high demand for smart meters due to the increasing awareness about energy consumption. On the basis of region, the NB-IoT chipset market has been segmented into North America, Western Europe, Asia Pacific excluding Japan, Eastern Europe, Latin America, Middle East & Africa, and Japan. China was witnessed to be the most dominant country in the global NB-IoT chipset market in terms of market share in 2017. Due to the investments made by the government for having a base of 1.5 million NB-IoT network base stations by 2020, the region is further expected to exhibit a high growth rate during the forecast period in the global NB-IoT chipsets market. Asia Pacific excluding Japan, in conjunction with Latin America, is expected to hold a market share of approximately 50% by 2020 in the global NB-IoT chipset market. With an intention of expanding the sales of NB-IoT chipset and strengthening their position in the NB-IoT chipset market, the vendors of NB-IoT chipsets are focusing on partnering/collaborating with various telecom service providers such as Vodafone, T-Mobile, and Sprint. Some of the participants in the global NB-IoT chipset market are Huawei Technologies Co., Ltd., Qualcomm Technologies Co., Ltd., Intel Corporation, ARM Holdings AG, u-Blox Holding AG, SEQUANS, Altair Semiconductor, Nordic Semiconductor, Quectel Wireless Solutions, and Sierra Wireless. As the NB-IoT technology is still at a nascent stage, only a limited presence of NB-IoT chipsets is witnessed in the global NB-IoT chipset market.